The A4 competes head-to-head with cars like BMW's 3 Series and the Mercedes-Benz C-Class, as well as a host of family cars like Toyota's Avensis, Ford's Mondeo and Opel's Insignia. Audi's challenger in the ultra-competitive compact executive saloon marketplace competes head-to-head with cars like BMW's 3 Series and the Mercedes-Benz C-Class, as well as a host of mainstream models like Toyota's Avensis, Ford's Mondeo and Opel's Insignia. Obviously that premium badge adds to the purchase price over its mass market rivals, but the running and ownership costs can actually work out much the same. Being one of its mainstay models and a huge international sales proposition, the A4 comes with a comprehensive choice of engines around the world. Not that you'd know it here in Ireland, as the 2.0-litre TDI absolutely dominates the used classifieds. You might find the odd 1.8-litre turbocharged petrol engine in 120- or 160hp forms, or the 2.0-litre TFSI with 180- or 211hp, though it's improbable. Not as improbable as the 3.2 V6 petrol, though, or the 3.0-litre turbocharged V6 of the performance-orientated S4 model. That's no complaint really, as the 2.0-litre TDI is a huge seller for good reason. It's available with a range of outputs from 120- through to 170hp, Audi additionally offering a pair of V6 turbodiesels in 2.7- and 3.0-litre capacities in the unlikely event that you'll find the 2.0 TDI's performance lacking. 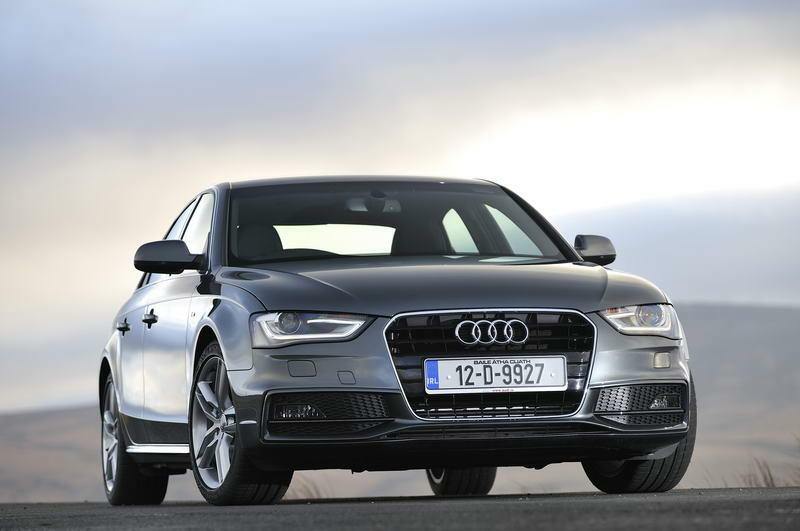 A four-wheel drive pioneer, the A4 is offered in some guises with Audi's quattro system for added traction. It's also sold as a smart estate (Avant in Audi-speak), which adds some useful luggage space. There are automatic choices over the standard six-speed manual gearbox too: the Multitronic is a CVT transmission, while S-Tronic denotes the dual-clutch automatic system. Trim lines follow the Audi norm, with SE, Sport and S line all present and correct; the latter features stiffer suspension though, which can upset the ride comfort. Specification in all is good, though many have been equipped with supplementary option packs for improved communications, integrated satnav and upgraded stereo equipment. The engine decision made for you with the 2.0-litre TDI dominating the classifieds, though given the choice we'd plump for the 143hp model over the 120hp one, as it brings improved performance without worsening the economy and emissions. SE spec is ample, but if you want sharper looks then Sport and S line bring some neat body styling tweaks - though the ride suffers thanks to stiffer suspension and bigger wheels. A commendable and desirable premium choice as an alternative to a mainstream family car, the A4 performs well. Good looks count in its favour too, as does its beautifully finished interior - though space could be better. Running costs should be little more, if not the same as, those for one of its mainstream rivals too.